"Was a very lovely woman to visit with at the family..."
"On be half of Eric and myself (Debbie); Hal, Rickie and Sam..."
"She was a devoted mother and loving wife." 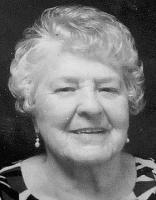 Dorothy Marie Bauder, 89, passed away peacefully in Battle Ground, Washington on July 9, 2015. She was born in Laramie, Wyoming March 26, 1926. Dorothy lived in Wyoming until age 16 when the family moved to Oregon. In 1947, Dorothy and Harold F. Bauder Sr. met while working in Cottage Grove, Oregon at J.C. Penney Co. They were married November 27, 1947 in the little chapel on the hill in Walker, Oregon. They raised four children in Vancouver, Washington. Dorothy was an active mother serving as PTA secretary, room mother and teachers aid. Her interests ranged from tailoring classes at Clark College to quilting, ceramics, and reading. Dorothy was involved in the Greater Federation of Women's Club, Emblem Club, Elks, Moose Lodge, and Clark College Foundation. Dorothy is survived by her children, Harold F. Bauder Jr. (Phyllis), Kris Nichols (Jerry), Linda Bauder, and John Bauder (Cathy); grandchildren, Ryan Bauder, Rachelle Lester (Eli), Sam Bauder (Melissa) and Nicholas Langland (Melana); great-grandchildren, Kylie, Kayla, and Korin Lester, Jacob and Lucus Bauder, and Izaelia Langland. She was preceded in death by her lifelong love, Harold F. Bauder Sr. in 2001. Please join our memorial service at Vancouver Vineyard Church, 1207 E. Reserve Street, Vancouver, WA 98661 at 1p.m., Saturday, July 18, 2015. Special thanks to Sequoia Meadows Adult Family Home for their loving Christian care. Contributions can be made in honor of Dorothy Bauder to the Clark College Foundation or flowers to 17603 NE 110th Avenue, Battle Ground, WA 98604.